The six edition of Electronics: A Systems Approach provides an outstanding introduction to this fast-moving, important field. 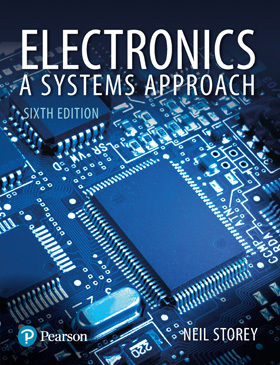 Comprehensively revised and updated to cover the latest developments in the world of electronics, the text continues to use Neil Storey's established and well-respected systems approach. It introduces the basic concepts first before progressing to a more advanced analysis, enabling you to understand what a system is designed to achieve before tackling the intracacies of designing or analysing its various components. The book also offers an integrated treatment of analogue and digital electronics, highlighting and exploring the common ground between the two fields. It also introduces the basics of electrical engineering, allowing the book to be used as a stand-alone text for introductory courses in both Electronics and Electrical Engineering. • Single-board computers (including the Rasppberry Pi and the Arduino). • Optical sensors and actuators. Perhaps one of the most significant features of the book, is the provision of over 100 video tutorials to support the text. These can be viewed on any computer, tablet or smartphone and provide invaluable support to the printed content. A full list of the available videos is available on the book's companion website (see below) or you can watch a taster video by clicking on the icon below. Publication details: Published by Pearson, 861 pages.